Highland Lakes—Steam-boats—Small Lochs—Wild Cats—Ravens—Dragging the Lake—The Crea—Fishing at Night—Pike—Trolling large Trout on Loch Ness—Flies, Otters, etc.—Fishing with the Otter—Spawning Trout. THE beauties of Loch Lomond, Loch Awe, and several other of the Highland lakes, are almost as well known to the English as Regent Street or Hyde Park. Lovely and magnificent as all these visited lakes are, and worthy of the praise of the poet and the pencil of the painter, there are unnumbered other Highland lochs whose less hackneyed beauties have far greater charms for me. Visit Loch Lomond, or many others, and you find yourself surrounded by spruce cockneys, in tight-waisted shooting-jackets, plaid waistcoats, and (so-called) Glengarry bonnets, all of whom fancy themselves facsimiles of Roderick Dhu, or James FitzJames; and quote Sir Walter to young ladies in tartan scarfs, redolent, nevertheless, of the land of Cockayne. Steam-boats and coaches are admirable things, but they spoil one's train of ideas, and terminate one's reverie when enjoying the grandeur and sublimity of one of these spots of beauty. Though a steamboat, at a certain number of miles' distance, with its stream of smoke winding over the rocky shore of a large lake, and adding a new feature to the scene, may occasionally come in with good effect ;—when it approaches and comes spluttering and groaning near you, with its smoke drifting right into your face, and driving you from some favourite point or bay, you are apt to turn your back on lake, boat, and scenery, with a feeling of annoyance and disgust. I well remember being one bright summer's day on the shore of Loch Ness, and enjoying the surpassing loveliness of the scene. The perfectly calm loch was like a mirror, reflecting the steep red crags of the opposite shore; and the weeping-birch trees, feathering down to the very edge of the water, and hanging over its surface, as if to gaze at their own fair forms in its glassy depths, were as distinctly seen in the lake as on the shore ; while here and there a trout rising at a fly dimpled the smooth water, and in my idle mood I watched the circles as they gradually widened and disappeared. The white gulls floated noiselessly by, as if afraid to disturb the stillness of the scene, instead of saluting their common enemy with loud cries. I had been for some time stretched on the ground enjoying the quiet beauty of the picture, till I had at last fallen into a half-sleeping, half-waking kind of dreaminess, when I was suddenly aroused by a Glasgow steamer passing within a hundred yards of me, full of holiday people, with fiddles and parasols conspicuous on the deck, while a stream of black sooty smoke showered its favours over me, and filled my mouth as I opened it to vent my ill-temper in an anathema against steam-boats, country-dance tunes, and cockneys. There have come in my way, during my rambles through the Highlands, many a fair and beauteous loch, placed like a bright jewel in the midst of the rugged mountains, far out of reach of steam and coach, accessible only to the walking traveller, or at most to a highland pony, where the only living creature to be seen is the silent otter playing its fantastic gambols in the quiet of the evening, or the stag as he comes to drink at the water's edge or to crop the succulent grass which grows in the shallows. There are so many small lochs which are known but to few individuals, but which are equally beautiful with those whose renown and larger size have made them the resort of numberless visitors, that it is difficult to single out any one as pre-eminent. In Inverness-shire there are many lovely lakes, and many an hour and day have I passed in fishing on some of these. There was one beautiful lake to which I used sometimes to take net and boat, as well as rod. It was a piece of water about four miles long, and one or two broad ; at one end were two sandy bays, forming regular semicircles, with their beaches covered to a width of a few feet with small pebbles. Between these two bays was a bold rocky promontory running into the lake, and covered with fine old pine-trees. Along one side was a stretch of perhaps three miles of grey precipitous rocks nearly covered with birch and hazel, which hung over the water, casting a dark shade on it. The other end of the lake was contracted between the rocks till it was lost to the view, while on the remaining side was flat moorland. The whole country round and within view of the lake was picturesque and bold. In the rocks near the water were a colony of wild cats, whose cries during the night deterred the shepherd from passing that way ; while on the highest part of the grey precipice was a raven's nest, the owners of which always kept up a concert with their voices of ill omen whenever they saw a human being near their dominions—there they would sit on a withered branch of a tree or a pointed rock, croaking, and playing their quaint antics for hours together. Their nest was so protected by a shelf of rock which projected blow it, that I never could get a rifle-ball into it, often as I have tried, though I must have frequently half-filled it with the splinters of the rock. In dragging this lake we were obliged to restrict ourselves to the two sandy bays, as the rest of the bottom was covered with old tree-roots and broken sticks, which tore our nets, and prevented our using them. In the quiet summer evenings it was interesting to see my crew of five Highlanders, as, singing a Gaelic song, they rowed the boat in a large semicircle round one of the bays, letting out the net as they went, one end of the rope being held by a man on the shore at the point from which they started. When they got to the other side of the bay they landed, with the exception of one man, who remained in the boat to right the net if it got fixed in roots or stones. The rest hauled in the net gradually, bringing the two ends together. As it came in, a fine trout or pike now and then would be seen making a dart round the enclosed space within the net, or dashing at the net itself, dragging for a moment half the corks under water. The head man of the crew, a little peppery Highlander, invariably got into a state of the most savage excitement, which increased as the net approached the shore; and if any stoppage occurred from its being caught by a root or stick, he actually danced with excitement, hallooing and swearing in Gaelic at the net, the men, and the fish. When all went on smoothly and well, he acted the part of fugleman with no little dignity, perched in the bow of the boat, and keeping the men in proper place and time as they dragged in the net. We generally caught a great number of trout and pike, some of very large size. By the time we had killed all the fish, and arranged them in rows to admire their beauty and size, the little captain (as the other men called him) subsided into a good-humoured calm; and having offered a pinch of snuff to the gamekeeper, whom he generally fixed upon in particular to shout at, in consequence of a kind of rivalry between them, and also in consequence of his measuring some head and shoulders higher than himself, he made a brief apology for what he had said, winding it up by saying, "And after all, that's no so bad, your Honour," as he pointed to some giant trout; he then would light a pipe, and having taken a few whiffs, deliberately shove it alight into his waistcoat pocket, and extracting a netting-needle and string, set to work, mending any hole that had been made in the net. This done, and a dram of whisky having been passed round, the net was arranged on the stern of the boat, and they rowed round the wooded promontory to the other creek, keeping time to their oars with some wild Gaelic song, with a chorus in which they all joined, and the sound of which, as it came over the water of the lake, and died gradually away as they rounded the headland, had a most peculiarly romantic effect. Sometimes we did not commence our fishing till sunset, choosing nights when the full moon gave us sufficient light for the purpose. Our object in selecting this time was to catch the larger pike, who during the day remained in the deep water, coming in at night to the shore, and to the mouths of the burns which run into the lake, where they found small trout and other food brought down by the streams. 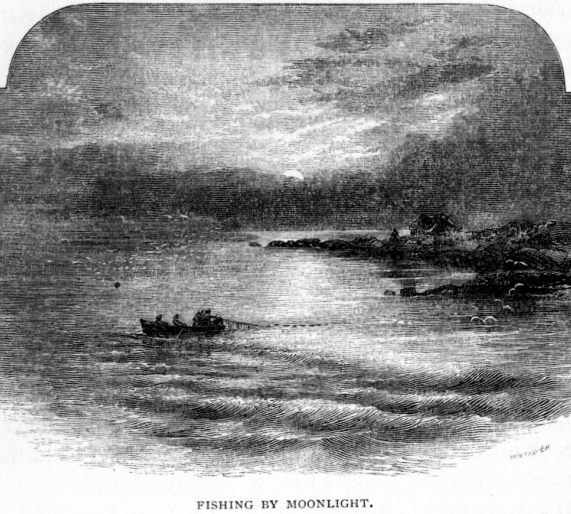 During the night time, also, towards the beginning of autumn, we used to catch quantities of char, which fish then, and then only, approached near enough to the shore to be caught in the nets. In the clear frosty air of a September night the peculiar moaning cry of the wild cats as they answered to each other along the opposite shore, and the hootings of the owls in the pine-wood, sounded like the voices of unearthly beings, and I do not think that any one of my crew would have passed an hour alone by that loch side for all the fish in it. Indeed, the hill-side which sloped down to the lake had the name of being haunted, and the waters of the lake itself had their ghostly inhabitant in the shape of what the Highlanders called the water-bull. There was also a story of some strange mermaid-like monster being sometimes seen, having the appearance of a monstrous fish with long hair. It was a scene worthy of a painter, as the men with eager gestures scrambled up, the fish glancing like silver in the moonbeams; and then, as they rowed round, sometimes lost in the shade of the pine-trees, which, completely darkened the surface of the water immediately below the rocks on-which they grew, or came again into full view as they left the shadow of the woods, the water sparkling and glancing from their oars. Frequently they stopped their wild chant, as the strange cries of the different nocturnal animals echoed loudly from the rocks, and we could hear the men say a few words of Gaelic to each other in a low voice, and then recommence their song. We always caught the largest fish at night-time, both trout and pike, the latter frequently above twenty pounds' weight, with the teeth and jaws of a young shark. Sometimes the net brought in a great number of char, which appear to go in large shoals ; but these latter only in the autumn. In these lochs I killed great numbers of pike and the larger trout by means of floating lines, which we put in at the windward side of the lake, to be carried down by the wind. On favourable days, in March or October, when there was a brisk wind, the lines went but half way across the loch before every hook had a fish on it, and then commenced a rare chase. When we neared a float with a large pike hooked to it, as the water was very clear, the fish took the alarm and swam off at a great pace, often giving us some trouble before we could catch him. I have seen an empty corked-up bottle, with line attached, used as a float for this kind of fishing, instead of the corks. Pike are very capricious in taking the bait, and some days not one would move, although the wind and weather all seemed favourable ; while on other days every float had a fish to it. Again, the fish would be quiet for some time, and then suddenly a simultaneous impulse seemed to seize them, and they would seize the baits as quickly as we could wish, for the space of an hour or so. The trout seldom take a dead bait during the daytime, but we often caught them on hooks left in the water all night. In all the Highland lakes on which I have fished in this way, large eels would sometimes take the hook, and often break my lines. It is frequently said that putting pike into a lake would destroy the trout-fishing ; but I have invariably found that in all lakes of a considerable size, where the pike were plenty, the trout have improved very much in size and quality, and not diminished even in numbers to any great extent. In fact, the thing to be complained of in most Highland lakes is, that the trout are too numerous, and consequently of a small size and inferior quality. The only way to kill the larger trout is by trolling. In Loch Awe and several other lakes I have seen this kind of fishing succeed well. If the sportsman is skilful, he is sure of taking finer trout in this way than he would ever do when fly-fishing. In trolling there are two or three rules which should be carefully observed :—Choose the roughest wind that your boat can live in ; fish with a good-sized bait, not much less than a herring, and do not commence your trolling until after two o'clock in the afternoon, by which time the large fish seem to have digested their last night's supper and to be again on the move. You may pass over the heads of hundreds of large trout when they are lying at rest and not hungry, and you will not catch one ; but as soon as they begin to feed, a fish, although he may have half-a-dozen small trout in his stomach, will still run at your bait. The weight of sinkers on your line, and the depth at which you fish, must of course depend on the depth of water in the lake. A patient fisherman should find out how deep every reach and bay of the lake is before he begins to troll. The labour of a day spent in taking soundings is well repaid. The strength and activity of the large loch trout is immense, and he will run out your whole reel-line if allowed to do so. Sometimes he will go down perpendicularly to the bottom, where he remains sulky or attempts to rub off the hooks : get him out of this situation, and away he goes, almost towing your boat after him. Then is the time for your' boatman to make play to keep up with the fish and save your line; for a twenty-pound Salmo ferox is no ignoble foe to contend with when you have him at the end of a common fishing-line : he appears to have the strength of a whale as he rushes away. I was crossing Loch Ness alone one evening with my rod at the stern of the boat, with my trolling-tackle on it trailing behind. Suddenly it was seized by a large trout, and before I could do anything but take hold of my rod he had run out eighty yards of line, and bent my stiff trolling-rod like a willow, carrying half the rod under water. The loch was too deep for me, and he snapped the line in an instant, the rod and the twenty yards of line which remained jerking back into the air, and sending the water in a shower of spray around. Comparing the strength of this fish with that of others which I have killed when trolling, he must have been a perfect water-monster. Indeed I have little doubt that the immense depths of Loch Ness contain trout as large, if not larger, than are to be found in any other loch in Scotland. For fly-fishing in lakes, it is difficult to give any rule as to the colour and size of your fly. The best thing you can do is to find out some person whose experience you can depend on, and who has been in the habit of fishing in the particular water where you want to try your own skill, for most lakes have a favourite fly. I have always, when at a loss, had recourse to a red, white, or black palmer. There are very few trout who can withstand these flies when well made. The size of the palmer should depend on the roughness or smoothness of the water. On a dark windy day I have frequently found a white palmer succeed when nothing else would tempt the fish to rise; while on a bright calm day a small black palmer should be tried. 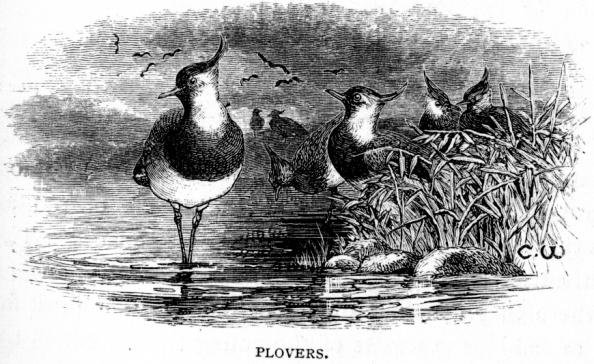 There are endless favourite loch-flies, and it is seldom that a person cannot be found to give you the requisite information as to which to use : however, I never feel much at a loss as long as I have some palmers in my fly-book. In putting night-lines into a large lake, the best places are those where any burn or ditch runs into it, or along some shallow sandy or gravelly bay, for in these places the fish feed during the night-time. Worms, frogs, and small trout are the best bait for night-lines. In trolling, the small silvery fish supposed to be the young of the salmon, or the small kind of herring called garvies, are the best bait. Preserved in spirits of wine, they keep for a long time, and become so tough, that they do not tear or break off your hook. If you take a fancy to fish with a fly during the night in a lake, a large black fly is the best, but unless it is drawn very slowly through the water, the fish, though they rise, will miss it. A small fly which I have found to be always a favourite with trout, is one made as follows :—Body yellow floss silk, with land-rail wing, and a turn or two of red heckle near the head. In most waters this fly succeeds. In some of the small black-look­ing lakes, far up in the solitudes of the mountains, where no person is ever seen, unless a shepherd may chance now and then to stray in their direction, or the deer-stalker stops to examine the soft ground near the water edge for the tracks of deer—in these lonely pools the trout seem often as unconscious of danger as birds are said to be on a newly-discovered island ; and they will rise greedily at the rudest imitation of a fly fastened to a common piece of twine, five or six trout rising at once, and striving who should be caught first. The fish in some of these lakes which are situated at a great height are excessively numer­ous, but generally black and small. I have seen little black pools of this kind actually crowded with small trout. The otter takes to the waters far up in the hills during the summer time, where she may rear her young in the midst of abundance and in solitary security. Making her lair on some small island or point of land covered with coarse grass or rushes, she lives in plenty and peace, till her young having grown strong, and the frost of winter having commenced, the family remove, like their betters, to the sea-side, passing over hill and valley in a straight line, to some remembered rocks and caves, where the dam has wintered before. small angular stones, numbers of which are invariably found in the stomach of the grouse, being probably necessary to grind down their dry and hard food. The hen-harrier and falcon too, seem to hunt in these places, knowing that if grouse fail them, they are sure to find either a duck or snipe, or perhaps a large flock of plovers huddled together on the pebbles which edge the water. In fact, the mountain lake seems to be always a kind of rendez­vous for all wild animals ; and I doubt if any grouse-shooter or deer-stalker ever passes near their clear waters without going out of his way to look along the margin, or to refresh himself by gazing over the cool surface. When you are shooting, too, there is the inducement of hoping to find a brood of ducks or teal, which few hill-lakes are without. I have sometimes found great numbers of these birds, collected in some quiet pool on the hills, in August or September, before they have descended to feed on the corn in the low country. Many a Highland lake has a legend attached to it, and how­ever improbable the tale may seem to the incredulous Sassenach, the Highlander believes firmly in the truth of it. Some person, endowed doubtless with a prominent organ of destructiveness, has within the last few years invented an imple­ment for fishing the lakes, called the otter; and though it is rather a poaching sort of affair, still I consider it quite a fair way of catching trout in some of the mountain lochs, where a rod could be used to no good effect, and where it would be impossible to launch a boat. Its principle of motion is exactly similar to that of a boy's kite. Acted upon by the resistance of the water, the otter, which consists of a small thin board, about four­teen inches by eight, and leaded on one edge so as to swim nearly upright, carries out a long line, which is attached to it by four short strings and is wound on a large reel. To this line are fastened a dozen flies on short lines, which, being carried along by the board, rake the surface of the water; and in windy weather I have caught numbers of trout in this way, where the rod would have been of no use whatever. Many a grilse, and salmon too, have I killed in Loch Ness with the otter. There are, however, some great drawbacks to the merits of this implement. The fish are very apt to escape after being struck by the hooks, and, being thus wounded and frightened, become shy, and unwilling to rise again. Also, if a large fish is hooked very near the board, there is a great risk that he will break your fly off, and go away with it sticking in his mouth. For these reasons, the otter, though of great use in certain localities, should never be used in waters where the rod can be brought into play. Though exciting enough in an unknown and remote lake, where you seldom fish, the actual sport which it affords falls far short of rod fishing. I have tried it for pike, but did not find it answer, as the fish were constantly struck without being hooked—in consequence of their requiring some time to gorge their prey. The angling in some of the best trout lochs is completely spoiled by the introduction of these instruments of destruction. Every shepherd's boy or idle fellow can make one, and carry it about with him ; and in lakes where this kind of fishing is prohibited, he has nothing to do, if he sees a keeper or watcher in the distance, but to wrap up the whole thing in his plaid, and walk away with it. There are but few Highland lochs in which a net can be drawn with good effect, owing to the unevenness of the bottom, and the risk of getting your tackle entangled and broken by roots and remains of trees, which always abound in these waters—the remnants of forests of an age gone by. Their great depth too is another obstacle to net fishing, excepting here and there, where a sandy bay or tolerably smooth bottom can be found. To these places the trout always resort in the evenings, in order to feed on the insects and smaller fish that frequent the small stones. In lochs containing pike, a hang-net, as it is called, placed across deep angles of the water or along the edge of weeds, is sure to catch them; this fish always struggling and endeavouring to press forward as soon as he feels the net, whereas the trout in these clear waters always escape the danger by turning back as soon as they touch the meshes. The Highland shepherds kill numbers of the spawning trout in the autumn, in every little stream and rill, however small, which feeds the lake. At this time of the year the trout are seized with an irresistible inclination for ascending any running stream that they can find; and I have seen large trout of several pounds weight taken out of holes in very small runs of water, to get into which they must have made their way for considerable distances up a channel where the water could not nearly cover them. Still, as long as a trout can keep his head against the stream, so long will he endeavour to work his way up. Numbers of fish, and always the largest, fall a prey not only to men, but to every prowling fox or wild cat who passes their way during the autumn, and all vermin instinctively hunt along the edge of water during the night time. A trout in shallow water is easily caught by any of these animals. Even the buzzard and the raven succeed in capturing them when they are left in small rills, as is frequently the case, having been tempted to ascend them by some shower, which swells the water for a short time and then leaves it as low as ever.